Ever wonder if Link gets tired of the green tunic? We can only assume his closet is nothing but green tunics. And every day he gets up and thinks "hmmm, I don't know, maybe green today!" On the one hand, every time he wears green he ends up fighting Gannon for the Triforce. On the other hand, every time he wears green he ends up with Zelda. Double-edged sword there (much like the Master Sword that Link wields to defeat Gannon, huh?!). Hmm, is each Link the same Link? Is the Link of Ocarina of Time the reincarnation of Link in Twilight Princess? Or is it more like history repeats itself, so every generation or so there happens to be born a Link, a Zelda, and a Gannon, each with a piece of the Triforce? Which, is also a kind of reincarnation? We're getting really confused on the Legend of Zelda timelines here! 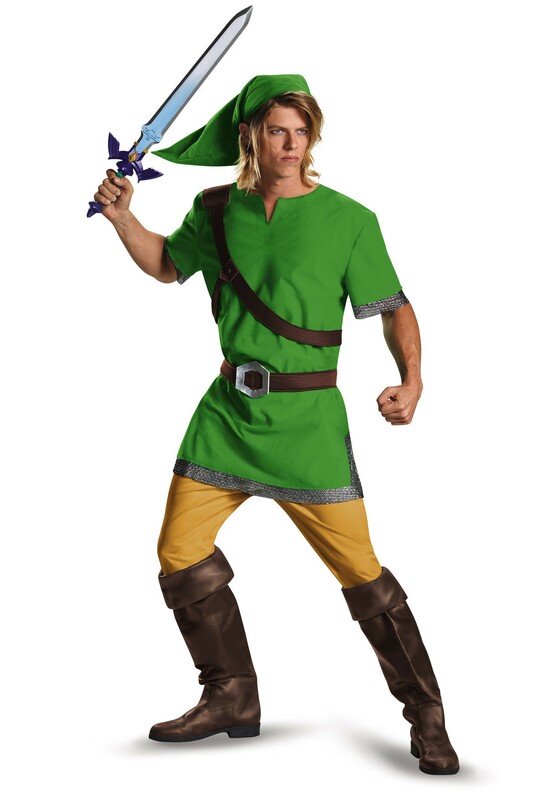 But whatever the timeline, this is yours, so get this costume for the chance to save your Zelda (Oooh, maybe Zelda Fitzgerald was a Zelda of our timeline and F. Scott Fitzgerald's first name was... Flink? Hmm okay scratch that). Whether you spend your time throwing pots on the ground for rupees, opening random treasure chests, or throwing bombs to find secret passageways (kinda dangerous, really), you'll be able to do it all in the only style that matters in Hyrule: green tunic! And if you're truly lucky, a princess named Zelda will catch your eye and all you'll have to do is battle Gannon and all his dark forces for control of the Triforce and save the land from darkness. Easy!